There’s a horrible feeling in business all too familiar to most of us – when you hit a quiet period, and despite your best efforts the takings are down and the venue seems quiet. Whatever the explanation we tell ourselves, the bigger problem in small businesses is that we are often the least prepared for any sort of a downturn, and we have so much less time to deal with it. And the worst of it is, it’s at this point that things can go from bad to worse. The Hole dissolves brand identity, demotivates staff, makes you turn your back on supplier relationships, and strangles the life out of the business. 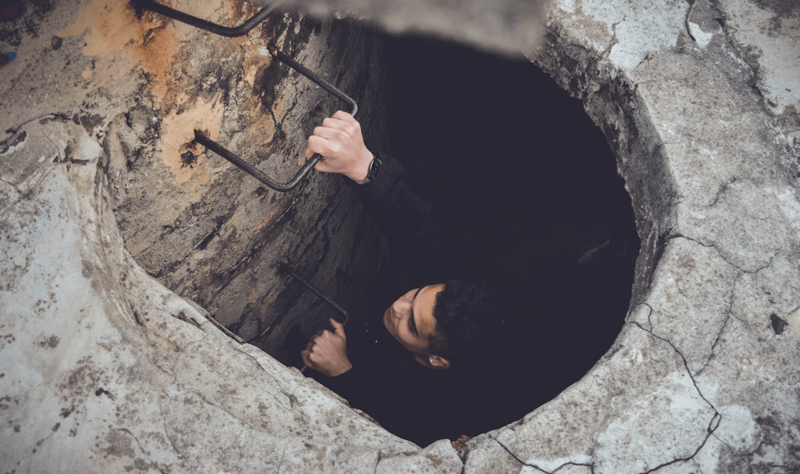 Once inside it’s incredibly hard to get out – You fall faster and faster and usually end up on the other side with a bump, no business and another hole in your bank balance where your business used to be. So, what starts the fall? In one word, Panic. Panic in business is what drives stock markets – in fact according to Investment site MotleyFool.com the reason people make such bad investors most of the time is that we are driven by emotion and not rational thought. Panic feeds decisions which otherwise would be incomprehensible. That staff member who’s been with you for 5 years and has never missed a day sick, – GONE, that menu item your customers love so much – GONE, Your focus on customer service, product quality and consistency, marketing, sales, your brand, your DIRECTION…. All by the wayside as fear grips you and panic dictates your actions. How do you avoid the Hole? The trick to avoiding the hole, is to know it’s there. Or more practically, to know when you’re heading towards it. There’s a few things you can put in place to make sure you don’t start to sink. The absolute golden rule is to keep calm. I know it’s easy to say, but practising a calm outlook has the effect of maintaining team moral and more importantly it conveys a ‘business as usual’ appearance to your customers. While we’re on the subject of customers, the cardinal sin is to discuss your difficulties with your clients. Our customers come to our businesses to escape their own issues, why would they want to hear yours? Bad news travels fast, and your innocent moan to your patrons soon spreads and grows until suddenly the word on the street (and social media) Is your business is going bust! Your team will be much happier knowing that the cuts or increases are equal, that it’s for a period of time, and that everyone is doing their bit for the business. Amongst the most important lessons I can convey, in any stage of your business, is knowing when to work and when not to, or at least have the ability to put problems out of your mind. Decompressing with your family, pets and friends is incredibly important and allows you to get away from ‘fighting fires’ to see the bigger picture. You’ll also be in a much better head space to deal with people when you do work. What are the best performing Gross Profit items? What are the best performing Revenue items? Cutting corners on your quality is a no-no and maintaining your product quality and consistency during tough periods is what makes the best managed businesses shine – and keeps your customers coming back for more. If you would usually toss a product after a certain time (like pastries for instance) make sure it still gets removed – but can it be reused into another dish? A Bread pudding, a hearty stew, pies etc. etc. Your aim is to cut down on your waste, and reuse items if possible. If they can’t be used and they’re not selling, why are they still on the menu? If you’re using a spreadsheet to work out your Roster, that’s ok, but is it up to date, and does it factor in Holidays, Sick pay, Super, etc? Does it take you over an hour per week to work out all the computations and pay run for your team, and could you use that hour in another area, like updating your social media and marketing? If you’re already having second thoughts about your system, I’d suggest switching to a workforce management App like Deputy – you’re going to save stress, time and money. Saving can be more important than increasing your revenue, if you think that a dollar saved roughly translates to $4 you need to make – once you factor in labour cost, fixed costs and cost of goods. Puts the roster savings into focus huh! The final tip extends beyond any downturn you might experience and should be something you think of throughout the life of your business. Trusting yourself and backing your decisions while keeping an open mind to advice or suggestions is the best balance for success. Knowing when to stick to your guns and maintain your brand identity, team or menu in your business is just as important as being receptive to change, to new ideas or new tech. Don’t be afraid to make decisions, the worst thing you can do is nothing! Use your sales data to back your intuition – take a breath and remember the positive steps you made in breaking from the herd and opening your business. You have the power to manage your business away from the Hole.